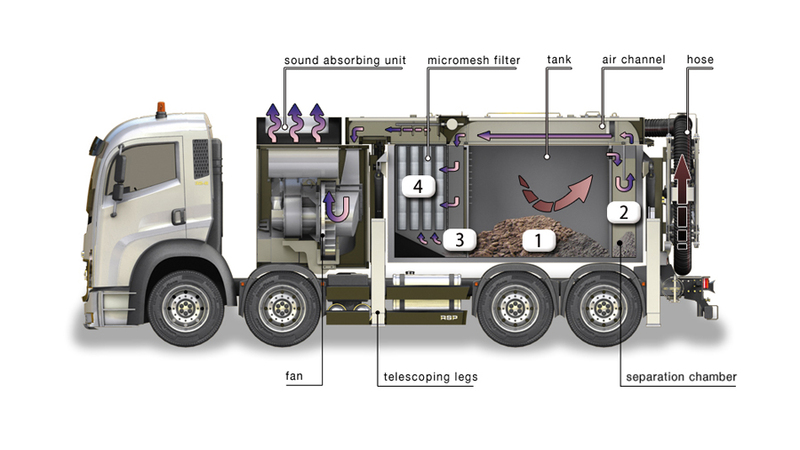 The excavated material is removed through a 250mm suction nozzle and deposited directly into the main collection chamber on board the vehicle due to the drop in air pressure and circulation. The air is then deflected through the air outlet chambers (four stage separation process) to clean, dry and remove the finer particles. The fine filter system separates the finest dust from the airflow before the clean air travels through the fan assembly. The purified air then travels through a special air outlet silencer before returning to the atmosphere. The air outlet chambers ensure that the pressure on the fine mesh filters remains very low and therefore high suction power is available even when removing water or damp media.